Fact: 1780294 out of 1780294 American Gladiator contestants who ate this for breakfast kicked the patooties of contestants who ate Wheaties or Kurt Vonnegut’s 1973 novel for breakfast. You just can’t argue with those numbers. For a long time, I always skewed to the “-unch” side of “brunch,” taking the non-breakfast savory route out whenever possible. In college, that usually meant settling for last night’s tofu parmigiana over danishes or “Eli’s Breakfast Sandwiches.” And I was one of roughly two people I can remember who could fathom touching the salad bar, even if brunch ran from 11 to 1h30. But now, in this post-mandatory meal plan age, I can create a happy compromise between my palate and gastronomic acceptability norms. It’s a breakfast salad. And it’s so freaking nutrient-packed that dietitians should shed low-sodium tears of hushed awe upon beholding its calcium-rich glory. And it tastes like sweet, nutty victory. I am a big fan of Google Reader, which is a very nice RSS reader, which, in turn, is a very nice tool that’s let you look at all the blogs you like to read in one convenient place. It makes your procrastinating much more efficient. It also has a lot of handy little features, including the ability to “star” a blog post so you can find it easily later. This is very handy for those of us who troll blogs looking for things to cook. I’d been starring things for a while without really sifting through them, until one day recently when I was entirely devoid of ideas for dinner. Flipping through the 25 or 30 posts that I had marked over the previous couple months, I was surprised to realize that over 75% were from just one of the dozen or so food blogs I read regularly: smitten kitchen. While there are a lot of food blogs out there that I like, and I think each (including this one!) has something good and unique to offer, smitten kitchen is the level to which I (and I think Claire as well) aspire. The photography is stunning and the recipes are extremely well-chosen, a nice mix of things to whip together on a Tuesday night and more elaborate dishes fit for a Saturday dinner party. These cold peanut sesame noodles fall into the former category and are a great springtime supper: quick to prepare, good cold, and providing a reasonably high dose of vegetables. Gyp room. Gyp-room. GYP ROOM! A GYP ROOM is a cruel joke of a student kitchen that provides a few antiquated and ailing appliances to starving grad students for a fee exorbitant in number and mandatory in nature! Also, cooking with fat or oil is prohibited in a GYP ROOM. WTF, right kiddets? Waooooh! Let’s try a sentence, okay? 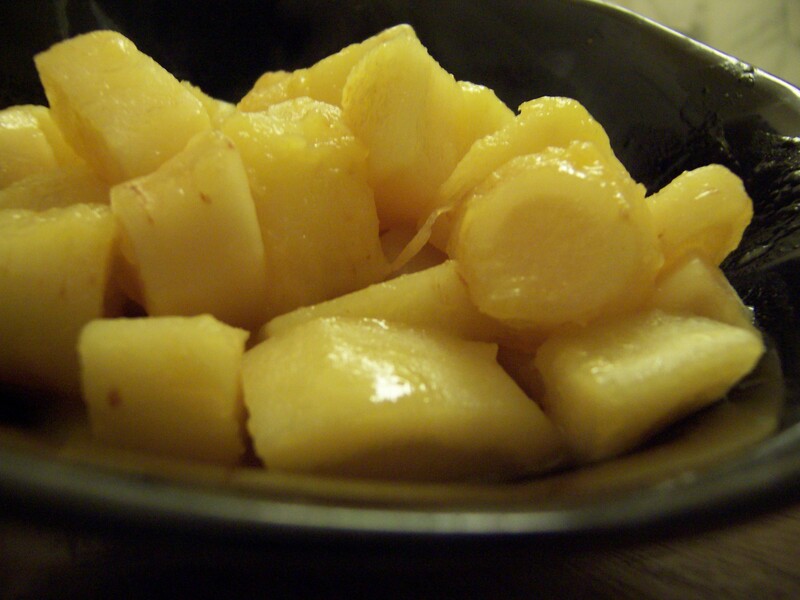 What the hell is a parsnip, anyway? Find out what they are, what you ought to do with them, and what Bunnicula has to do with all of this over at the Yale Sustainable Food Project blog . Food Junta on Bon Appétit! Exciting news, everybody: Bon Appétit is featuring a bunch of bloggers’ holiday recipes on their web site, and Food Junta’s tempura fritto misto is one of them. The Blog Envy slideshow features a bunch of blogs we love (not a total surprise, since Claire freelances for BA and helped put the slideshow together), and introduced us to some new ones, as well. So check it out here; you just might find a new food blog to RSS.